Various reference has been received from different Controllers regarding grant of benefit of MACP for the Central Government Civilian Employees. In this connection, it is intimated subsequent to implementation of VIth CPC, Modified Assured Career Progression Scheme was introduced with effect from 01/09/2008 vide DOP&T OM No 35034/3/2008-Estt(D) dated 19/05/2009. Subsequently, clarifications/FAQs have been issued in the matter vide DOPT OM dated 16/11/2009, 09/09/2010, 01/04/2011, 13/06/2012, 04/10/2012 and 10/12/2014. 2. In this matter attention is also invited to Para 4 of Annexure 1 to OM Dated 19/05/2009, which clearly stipulates that benefits of pay fixation available at the time of regular promotion shall also be allowed at the time of financial upgradation under the scheme. 3. With the implementation of 7th CPC, DoPT vide its OM No.F.No. 35034/03/2015-Estt(D) dated 27/28th September 2016 has made amendments to Para 1 & 2 of OM dated 19/05/2009 and Para 17 (annexure to OM dated 19/05/2009 vide Para 3 and 5 respectively, while making the changes effective from 25/07/2016, i.e. date of resolution notification by DOPT. 4. Thus it is imperative from the DOPT OM dated 27/28th September 2016 that the provisions contained in OM Dated 19/05/2009 (with subsequent clarifications/FAQs dated 16/11/2009, 09/09/2010, 01/04/2011, 13/06/2012, 04/10/2012 and 10/12/2014) read with amendments as proposed in DOPT OM Dated 27/28th September 2016 are in effect w.e.f. 25/07/2016. 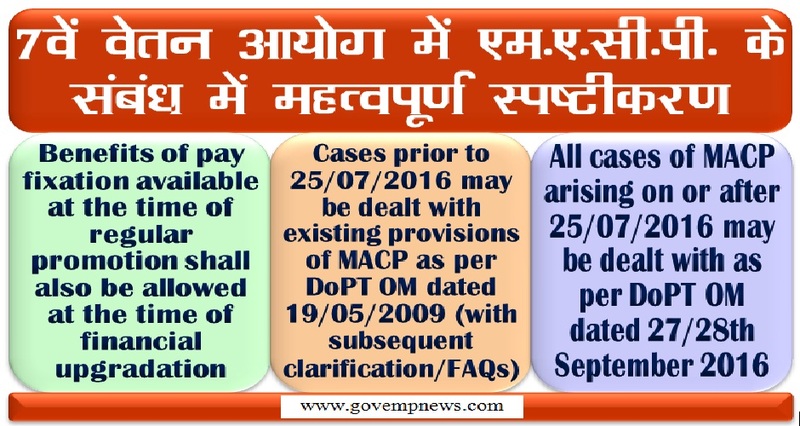 Accordingly all cases of MACP arising on or after 25/07/2016 may be dealt with as per DOPT OM dated 27/28th September 2016. 5. 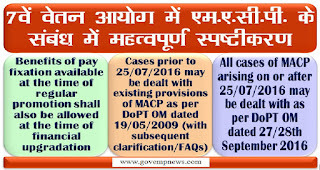 Cases prior to 25/07/2016 may be dealt with existing provisions of MACP as per DOPT OM Dated 19/05/2009 (with subsequent clarifications/FAQs dated 16/11/2009, 09/09/2010, 01/04/2011, 13/06/2012, 04/10/2012 and 10/12/2014). 6. It is further intimated that the orders on comprehensive MACP Scheme as mentioned in DOP&T letter dated 28/09/2016 have not yet been issued by DOP&T. The same shall be circulated on receipt.